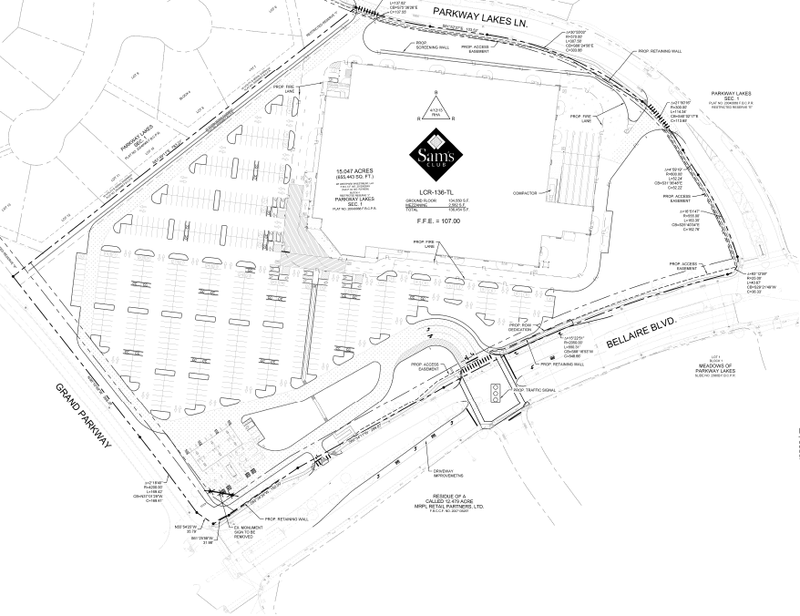 Sam's Club planned for NE corner Bellaire and grand parkway. This is in the works. Makes sense with Walmart here and Costco going in up the street. Do you have any additional info on the Sam's Club? Construction start/finish dates? Saw Survey teams yesterday marking off the land. Looks like it could be done by Summer. Roche contractors was awarded the contract and expects a finish date of September 2014. Note that this announcement as well as the construction plans locate the store in "Cinco Ranch" - I suppose because it is the most well-known nearby community. Edit: Confirmed location of traffic signal at Bellaire / Parkway Lakes Ct in "6050-OVERALL_SITE_PLAN-6867_v1.pdf". Also the store faces the southwest. I kind of like this layout better than facing west towards Grand Pkwy. Just got the following in an email from my neighborhood talking about nearby road completions. Not quite a news flash but its good to know the timeline. Mason Road completion to 99 is dependent on the neighboring developer. As the community is built out the roads will be built. We wish everyone to have a safe Memorial Weekend! New open date is early November. The new Sam's Club opens Thursday November 6. I think they're having a sneak peek on Wednesday, 5th from 5 to 8 pm.